Scomis Hosted Application v6 – What’s New? Version 6 has been built around Microsoft’s .Net Framework and contains all of the previous features and functionality of the v5.42 client (the last main release). **IMPORTANT** Because the v6 connector is built using .Net Framework, any computer that will be used to access the Scomis Hosted platform, MUST have Microsoft’s .Net Framework (Version 4.0 or above) installed, otherwise the connector will not work. Most computers will already have .Net 4.0 or above installed but some builds of Windows may have been designed without it so if in doubt please check. The .Net Framework can be downloaded directly from Microsoft, from here. The v6 connector will work with any version of .Net from version 4.0 and above. The shortcut icon remains the same as before but the connector itself does look different when launched. Service Status – The Service Status is more prominent than previous versions and is still the visual indicator of our service status, in the event of a known problem or upcoming planned maintenance the icon will change to; Amber (Service is impacted), Red (Service is unavailable) or Blue (Planned Maintenance). These will updates will provide a clickable link taking you to a description of the notification. 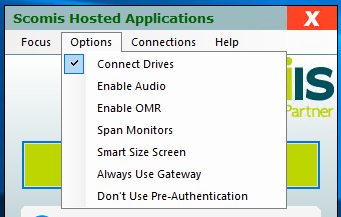 The “Connect Drives” option is still ticked by default under the “Options” menu to ensure that the Local Drives from the client computer are picked up by the Hosted platform to enable easier file transfer when necessary. Also under the “Options” menu, the “Screw Drivers” option has been removed, as the updated Server 2016 Hosted platform uses the native Microsoft Remote Desktop Printing Solution (EasyPrint). PLEASE NOTE – Do not remove the ScrewDrivers software from your computers until advised to do so by Scomis. Screwdrivers is still required to enable printing until a school has been fully switched over to the updated server 2016 platform. 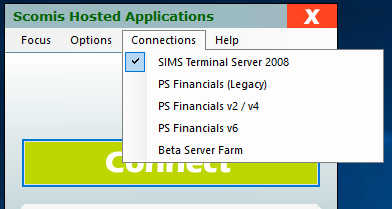 Under the “Connections Menu” there is an option for “SIMS Terminal Server 2008” this will allow users to switch between the current 2008 platform and the updated 2016 version, this can be useful if a user is having an issue on the updated platform. 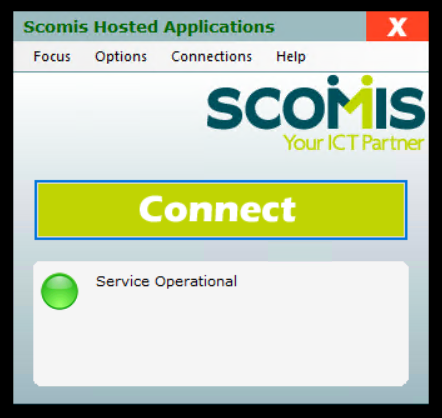 Following the connector being upgraded, this option will be ticked by default, meaning users will continue to connect to the current 2008 platform, until they are switched over by Scomis to 2016. Under the “Help” menu there is now a “Connectivity Diagnostics” test. This can be run in the event of connectivity issues and the results used by support colleagues to help identify the issue. 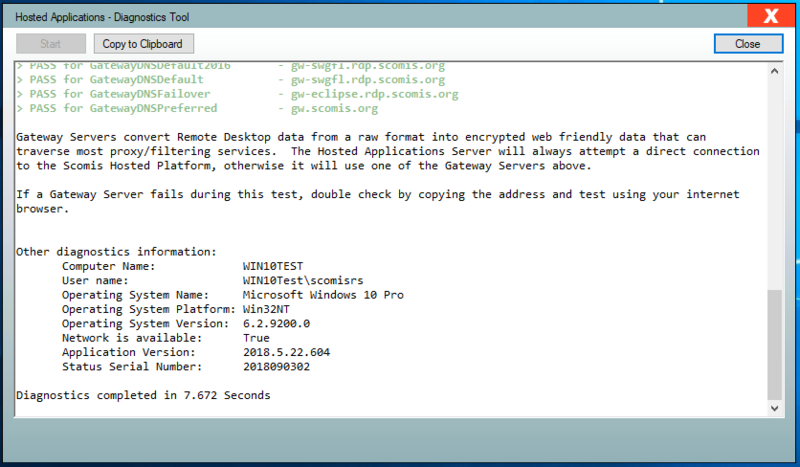 The Diagnostics Tool contains data on the available connections, access via these connections and details of the currently used client computer. Posted in Connector, Hosted Apps, SIMS.net and tagged 2016, connector, hosted, Hosted Application Service, V6.